I mentioned earlier this summer that we’re very close to our Beta milestone, and one of the few remaining tasks is to polish up the remaining in-game art and cosmetics. Today, I want to give an update on how that’s going. Custom attack animations have been added for a number of Prismata units. The above animations aren’t even final yet. The “square ends” of Tia Thurnax’s laser will be fixed in an upcoming patch, and the white flashes above Zemora and Wincer are being replaced by more appropriate particle effects. You can blame me for being nitty about those sorts of details, much to the annoyance of everyone who wants the game to ship as soon as possible! Our overarching goal is to have a robust set of animations for every unit ability in the game. In particular, we want the look and feel of each unit ability to communicate its theme, importance, and function in the game. For example, Tesla Coil and Cauterizer both give off an electrical *zap* when clicked, but Tesla Coil’s is a little bigger. Our sound designer has been getting to work on unit abilities as well. Previews coming very soon. We have plans for a huge number of additional skin sets, but I’ve made the call to not send out work orders for them yet (mostly because we want to leave a bit of wiggle room in the budget so we have some flexibility with our launch spending). New skin sets get turned around pretty quickly, so we can add them with only a week or two of notice whenever it’s time. They’ll happen as soon as we can confirm that our Steam Early Access launch is going well. Necromantic Engineer will be the next Master’s League skin prize. These types of effects are very easy to add, so expect to see more of them. They yield a pretty good bang-for-buck when it comes to balancing the quality of our cosmetic content with our desire to actually finish the game! The Campaign is almost art complete, meaning that the vast majority of the assets have been finished. This includes characters, mission backgrounds, menu screen backgrounds, and even some video content. 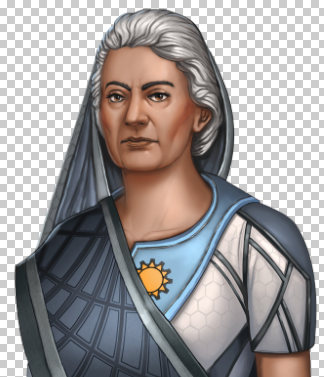 You’ll meet Samita in the Prismata campaign. Here’s a more detailed progress report: the in-house work for the early campaign missions is essentially 100% done, and of the externally contracted materials, the only things remaining are a few mission-specific units. The only reason that they aren’t done yet is that we’re still tinkering with the mission designs themselves in ways that can affect the art. For example, we recently changed a mission in which the enemy shields periodically go down to one in which the player has access to a Shield Killer item that can be used to disable the enemy shields. That item will then need a display picture. Once the mission designs are close to final, we’ll send out the order for the new units to be drawn up. Of course, even with most of the art assets completed, there will still be countless hours spent tinkering with the final in-game look of each character, in-game animation, and unit design. It’s a process that never really ends, and every piece of feedback we receive informs our actions moving forward. It’s vitally important that Prismata is visually polished when we hit Steam, and there will be continuous improvements throughout the beta period. I look forward to deploying all of this new art in our next Prismata alpha update!